If you want your IAQ to be just right in your facilities, trust testo 160 IAQ. Facility management is truly a case of Goldilocks and the three bears – your space is too hot or too cold, how do you get it to be just right? This is an important question that facility managers must find a reliable solution for, as controlling the environment of a space can impact all that work within it. Research has suggested massive negative impacts between sub-optimal temperatures, happiness and productivity – you don't want to leave this unchecked. If a facility's environment isn't in balance, you risk endangering the health and well-being of all those who work on the site as well as the products stored inside. If the facility environment isn't in balance, you risk endangering the health and well-being of all those who work on the site. Adequate control over a facility's environment isn't easy to monitor. Everything from temperature to humidity to CO2 and atmospheric pressure needs to be closely monitored but is virtually impossible via the naked eye. That's why it's crucial that managers only use top of the line instruments to measure indoor air quality (IAQ). 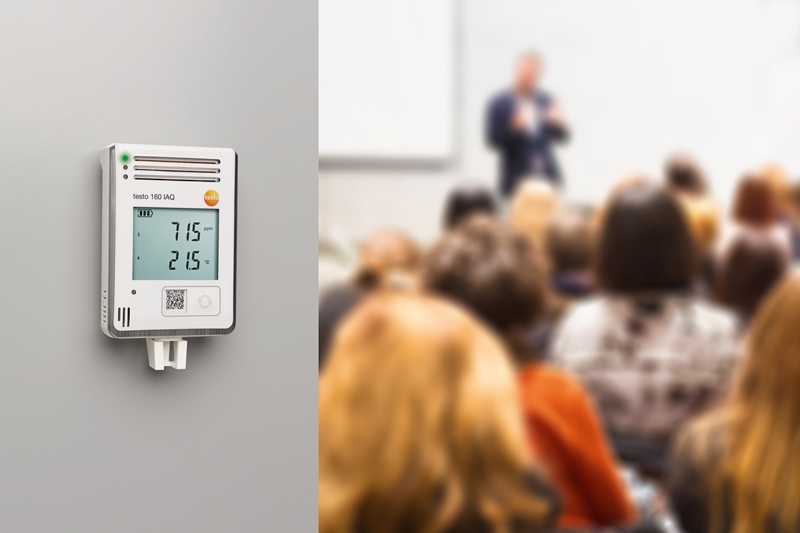 The testo 160 IAQ Wi-Fi data logger assists facility managers with monitoring and optimising all those elements that make up the indoor air quality. The testo 160 IAQ is ideal for monitoring particularly sensitive environments. The Wi-Fi data logger is integrated with sensors that measure temperature, humidity, CO2 and atmospheric pressure in every room you look after. The measurement data stored by the logger goes to the cloud where you can assess it from your mobile device wherever you are. Should a limit value be out of place, you will be notified immediately via the real-time alarm function. This immediate notification is imperative when it comes to the health and safety of everyone/everything in the building. The data logger itself is small enough so it can be placed anywhere in a room without notice. This isn't just useful for busy office spaces, it can be essential for ensuring conditions are perfect for delicate artefacts or works of art in museums or archives. The internal data storage capacity of the logger is 40,000 measuring values allowing you to have a wide and reliable watch over the conditions of multiple rooms at once. When our IAQ is optimised, no one within the environment is going to notice, and that's a sign of you doing your job just right. To learn more about how Testo instruments can help monitor your indoor air quality, contact our team today.